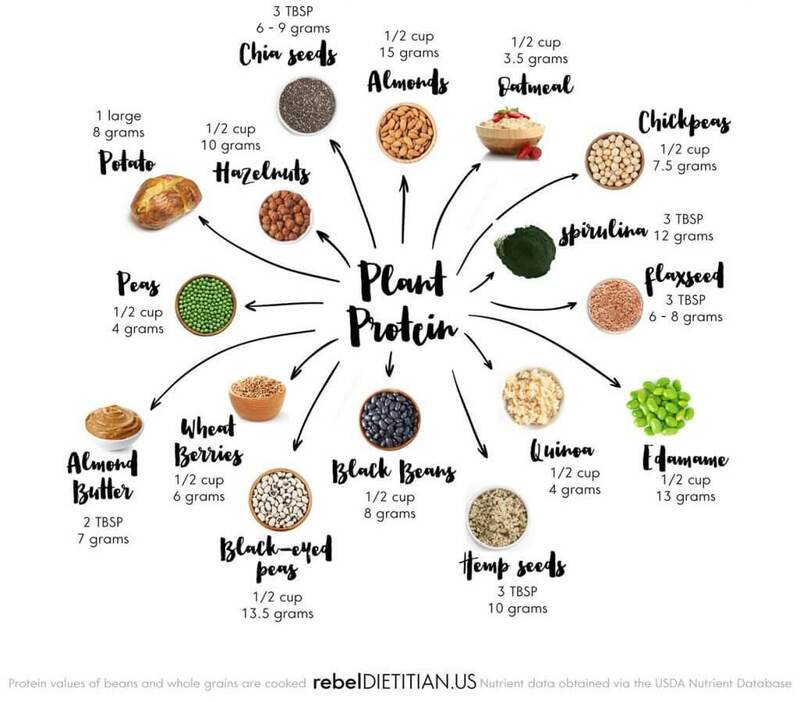 For all of you leaning towards a meat-less challenge, but have concerns about losing out on vital proteins, this one’s for you! Cutting meat out, whether for a short period of time or for a drastic lifestyle change, can be done safely and deliciously. There are recipes out there that ensure you’ll be getting your fair share of nutrients, proteins, healthy fats and calories. So don’t let the nay-sayers put you off. Cutting meat out isn’t a penalty sentence, and you can still incorporate all your favourite flavours that make meat dishes so mouth-watering, so you’re not sacrificing it all. Often, once we’ve gone a while without eating meat, the desire goes away, and more than that. It’s quite common to feel put-off by the smell, or thought, of eating any dead animal once you’ve been thriving off plant protein. We hope these tried and tested plant protein-packed ‘New Year, New Me‘ recipes will delight, entice and serve as inspiration for a healthy 2017. While the ingredients in this chili are super basic, the flavour is anything but. Simple ingredients can taste exceptional when they start off with aromatics like onion, carrot, celery and garlic. I added traditional chili spices and some smoked paprika for a savoury, smoky note. Blending a small portion of the chili makes it look and taste like a chili that has been cooking all morning long, but it only needs about 30 minutes of simmering. 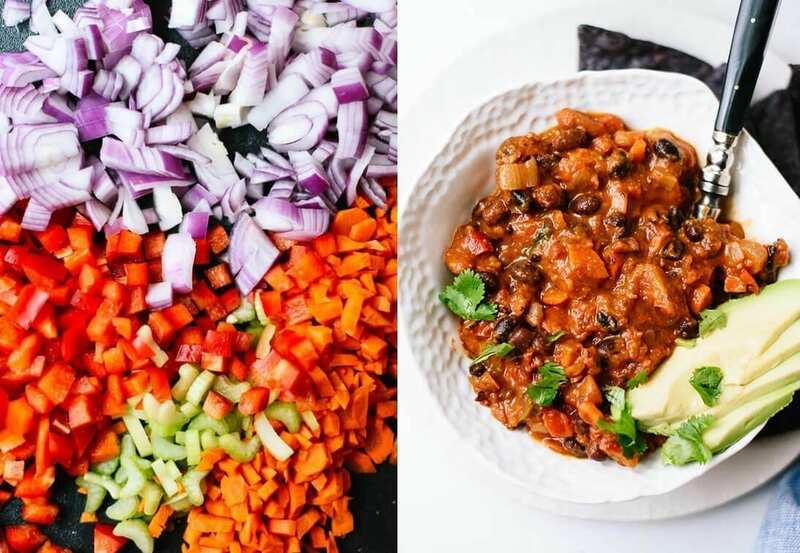 This chili recipe is gluten free as written (just be sure your garnishes are also gluten free), and vegan (unless you top it with dairy products like sour cream or cheese). *CANNED TOMATOES NOTE: I recommend Muir Glen brand—they have the best flavour and their cans are BPA-free! In a large Dutch oven or heavy-bottomed pot over medium heat, warm the olive oil. Add the chopped onion, bell pepper, carrot, celery and ¼ teaspoon salt. Stir to combine and then cook, stirring occasionally, until the vegetables are tender and the onion is translucent, about 7 to 10 minutes. Add the chopped cilantro, stir to blend, and then mix in the vinegar, to taste. Add salt to taste, too—I added ¼ teaspoon more at this point. Divide the mixture into individual bowls and serve with garnishes of your choice. This chili will keep well in the refrigerator for about 4 days (I haven’t tried, but I bet it would freeze well, too). Amazing vegetarian enchiladas stuffed with black beans, broccoli, bell pepper and spinach, topped with homemade red sauce. My favourite enchilada recipe! 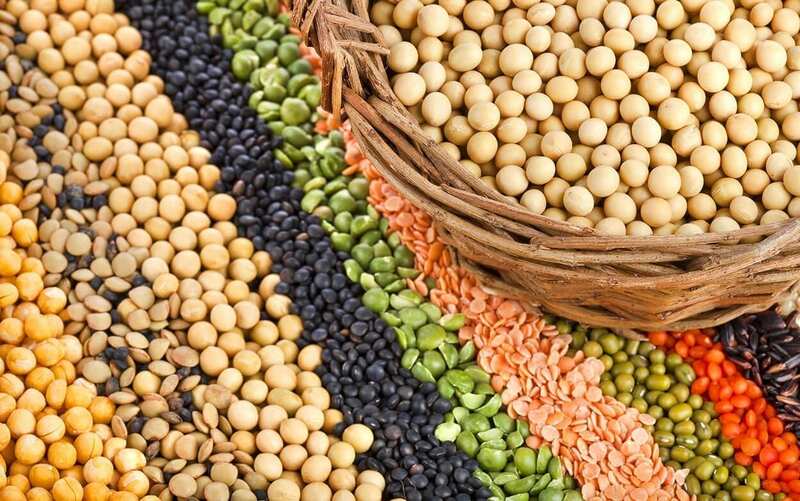 Officially categorised as one of the ‘world’s healthiest foods,’ this bean is a plant protein paradise. But that’s not even it’s main attraction. The black bean is absolutely chocked full of molybdenum, a mineral which helps multiple enzymes in the body carry out their functions optimally. This rich bean is also wealthy in folate, manganese, copper, vitamin B1, phosphorus, magnesium, iron and of course, dietary fibre. If you’re wondering why the first recipe is lacking an “about beans” section, it’s simply because it’s similarly nutritious. The chili base of pinto beans and black beans (both needed in Chili Sin Carne) make for a cosmic explosion of nutrient-dense taco-shell filling. The pinto bean and black bean are extremely similar in their nutrient profile. They’re so close you could almost call them twins. Preheat oven to 400ºF with one rack in the middle of the oven and one in the upper third. Lightly grease a 13 by 9-inch pan with olive oil or cooking spray. In a large skillet over medium heat, warm the olive oil until simmering. Add the onions and a pinch of salt. Cook, stirring often, until the onions are tender and translucent, about 5 to 7 minutes. Add the broccoli and bell pepper, stir, and reduce heat to medium-low. Cover the skillet (I don’t have a lid for mine, so I just placed a cookie sheet on top). Cook, stirring occasionally, for about 8 to 9 minutes, or until the broccoli is brighter green and just starting to turn golden on the edges. Assemble the enchiladas: Pour ¼ cup enchilada sauce into your prepared pan and tilt it from side to side until the bottom of the pan is evenly coated. 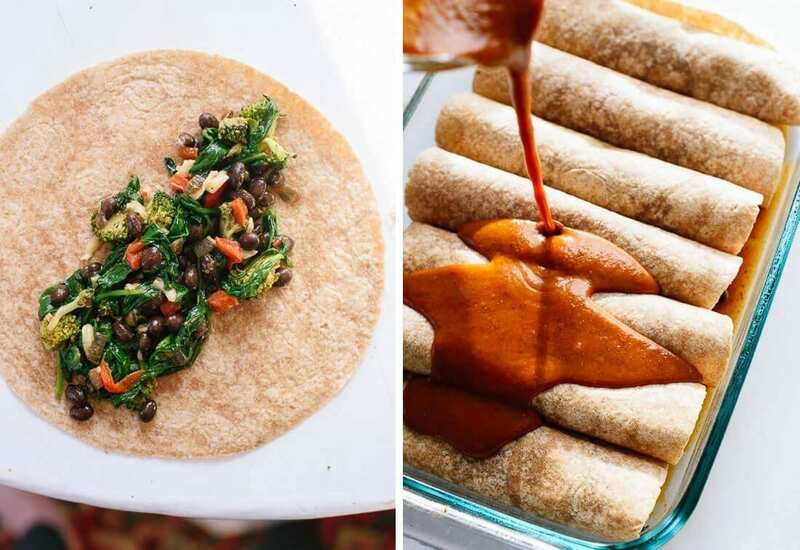 To assemble your first enchilada, spread ½ cup filling mixture down the middle of a tortilla, then snugly wrap the left side over and then the right, to make a wrap. Place it seam side down against the edge of your pan. Repeat with remaining tortillas and filling. Drizzle the remaining enchilada sauce evenly over the enchiladas, leaving the tips of the enchiladas bare. Sprinkle the remaining shredded cheese evenly over the enchiladas. This sauce comes together quickly once you get started, so measure the dry ingredients (the flour, chili powder, cumin, garlic powder, oregano, salt and optional cinnamon) into small bowl. Place it near the stove. Place the tomato paste and broth near the stove as well. In a medium-sized pot over medium heat, warm the oil until it’s it’s hot enough that a light sprinkle of the flour/spice mixture sizzles on contact. This might take a couple of minutes, so be patient and don’t step away from the stove! Once it’s ready, pour in the flour and spice mixture. While whisking constantly, cook until fragrant and slightly deepened in colour, about 1 minute. A delicious, healthy, textured soup made from an impossibly short list of ingredients. No ham hocks in this version, simply green split peas and onions cooked until tender, then partially pureed – it’s packed with plant protein! 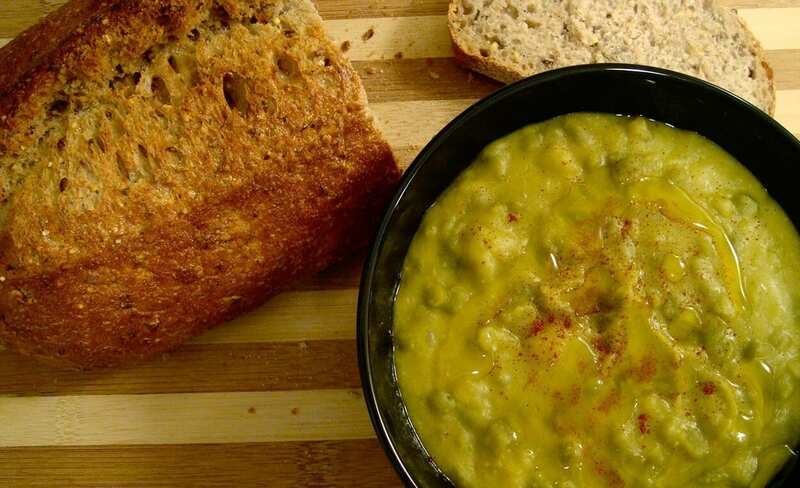 The vibrant green soup is finished with a generous drizzle of golden olive oil, a few flecks of lemon zest, and a dusting of smoked paprika to give the soup some smoky depth. I thought about throwing a couple handfuls of small broccoli trees into this soup (a few minutes before doing the puree), spinach would be great as well. You can use a vegetable stock if you like in place of the water. I use about 1/2 of one cube in a soup like this to kick things off – it makes a nice, light but flavourful broth. Abundant in plant protein, these delightful pips of greeneries are low in sodium, saturated fat and cholesterol. Scoring high on the health-food chart, they’re rich in folate, manganese, thiamin and iron. Not to mention a fantastic source of dietary fibre. All legumes are great for you, but these friendly fellows are too cute to pass up, and pureed into soup is a genius way of stuffing them in (your face). Using a large cup or mug ladle half of the soup into a bowl and set aside. Using a hand blender (or regular blender) puree the soup that is still remaining in the pot. Stir the reserved (still chunky) soup back into the puree – you should have a soup that is nicely textured. If you need to thin the soup out with more water (or stock) do so a bit at a time. Stir in the lemon juice and taste. If the soup needs more salt, add more a bit at a time until the flavour of the soup really pops. Ladle into bowls or cups, and serve each drizzled with olive oil and topped with a good pinch of smoked paprika and a touch of lemon zest. Our diplomas are recognised in 26 countries, and all of our schooling is done online so there is no stress, no deadlines, no commute and no start up expenses! Enjoy education the holistic way!